Sources indicate that after his father’s death, he acquired knowledge from Khawaja Khidr (R.A.), whom he met in secret on mahim seashore every morning. (Khawaja Khidr - is regarded as patron saints of travelers and mysterious figure connected with initiation and the highest sources of mystical inspiration). Though there is no confirmed proof of the same. 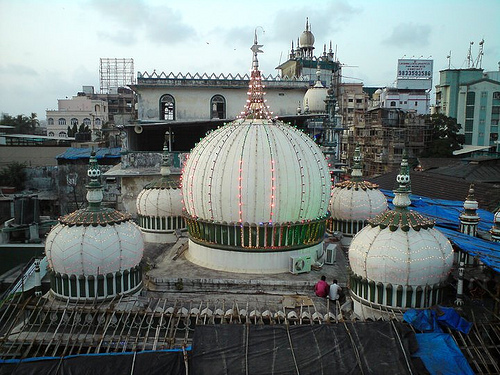 Makhdoom ali mahimi‎ (رحمتہ اللہ علیہ) belonged to a group of Sufis named Uwaysi - those who have not received a formal initiation by a living master and are not affiliated to any known order like the Chishti or Suhrawardi in India. Mahimi was the first Indian scholar to write an exegesis on the Qur'an, which gained critical acclaim from numerous Islamic scholars including Shah Waliullah‎ (رحمتہ اللہ علیہ). His biographies in Persian and recently in Urdu, state that Makhdum Ali Mahimi‎ (رحمتہ اللہ علیہ) was well versed in the traditional Islamic sciences, including theology, jurisprudence, philosophy, and mysticism. He was one of the first Islamic scholars in India to have written a commentary in Arabic on the Quran, as well as expounding Shaikh ul –Akbar; Ibn-e-Arabi's doctrine of Wahdat al-wujud, or unity of being. Makhdum Ali Mahimi‎ (رحمتہ اللہ علیہ) has left a legacy of religious and literary works. The most distinguished amongst these is his pioneering commentary on the Quran al-tafsir ar-rahmani. Written in a simple style, it comprehensively examines the subtle links between the different chapters in the Quran and their verses. He discusses the Quran's mystical and non-mystical aspects and the relationship between them. It mentions how this was a socio-cultural event to which Bombay residents came to make vows as well as to enjoy the amusements. They partook in the fair on the causeway where "toys of European make, local metalware, sweetmeats and food" are sold. In an earlier publication, Towns and Islands of Bombay, a government order of 1694 quoted to give permission to "Moormen (Nawaits) to worship at the tomb at Mahim as customary". A 1739 order granted the chief officer at Mahim the liberty for keeping of the Mahim fair: "You are hereby ordered to permit the people to have the country music and to exercise such other diversions as are customary at that time and to give assistance to prevent any disturbances or disorder being committed." As important event in the annual life of the Dargah is the display of a highly treasured Quran - its ink and paper are in prime condition - believed to have been copied by Makhdum Sahib‎ (رحمتہ اللہ علیہ) himself. (However some scholars are of the firm opinion that is was made later, in 1564 by Maulana al-Mukri‎ (رحمتہ اللہ علیہ).) The Quran is displayed just once a year, on the eve of Laylat al-Qadr, the night of Power when the Quran was revealed. This event is observed on the eve on 29th of Ramadan. The scholar-saint of Mahim is remembered for many reasons. Many remember him for the very human qualities he possessed - his love for and obedience to his mother, his humility, his self-control, and his generous nature that made guests welcome - that are mentioned in biographies like Damir al-Insan.